Mr. Mark Bailey shares his experience about his trip to India and how he always wanted to make a trip to this fascinating land and witness her proud people, culture, food and cricket. We have taken excerpts from his detailed review on Tripadvisor. 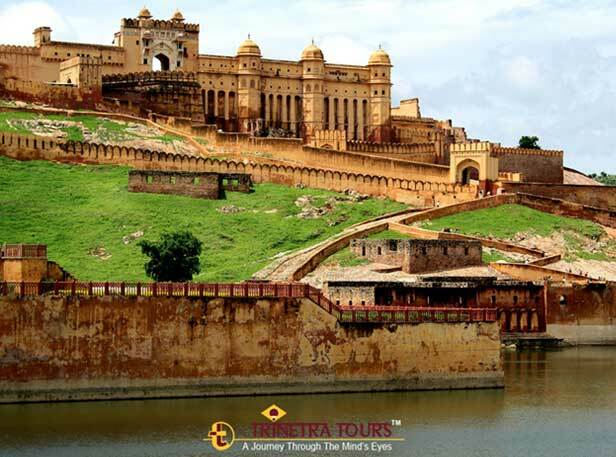 “This report was written as a daily diary as my wife and I travelled for two weeks around Northern India/Rajasthan. It features brief comments on the hotels we stayed in, the exciting places we visited and the amazing people we met and our thoughts and opinions of what it is truly a wonderful country. But right up front I want to say that this epic adventure could not have happened without those wonderful people at Trinetra Tours – Rahul and Mahendra. Trust me, as an ex Tour Operator, these guys are the best in the business. My wife and I had wanted to visit India for some time. A love of Indian people, their culture, superb food and cricket (yes I am a Yorkshireman) meant that India had risen to the top of our bucket list of countries. So where actually to go, how to plan, what to do? Many questions and the research began. Pretty soon it became clear that I did not want to book through a UK Tour Operator such as Kuoni or Hayes and Jarvis, good as they are. Their lovely brochures gave inspiration, web research added to the mix but the TOs understandably had based their tours when the exchange rate was not too favourable (£ against the Rupee) and they of course had margins to make that I didn’t want to pay for. 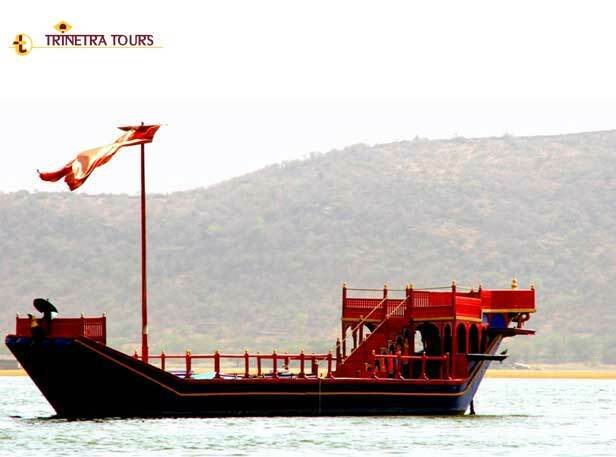 We vaguely knew that we wanted to go to the key Golden Triangle destinations, but fancied checking out Udaipur, Ranthambore to see some Tigers and a city I had wanted to see for many years, Varanasi. Question: Should I book the entire tour independently or rely on the services of a Ground Handler/Local TO (Tour Operator)? So it was with great interest that I stumbled online across Trinetra Tours when linking through various pages on Tripadvisor. A very high number of five star ratings, excellent comments and just as importantly responses by the Senior Management to comments made, particularly if one or two correspondents had felt aggrieved or unhappy – one only out of about 50 if my memory serves me well. So armed with my “rough outline” of what we wanted to do, I made contact in September 2013 by email. Virtually straight away I received a response from Mahendra and then Rahul. What great people. Full of ideas, professional advice and suggestions as to what we could do. Could I have found a company that really did get it? A company that cared? An organisation that believed in service and value for money? I thought I probably had. And six months after my first email and having had two of the best weeks of my life I can confirm that this was one of my better decisions. 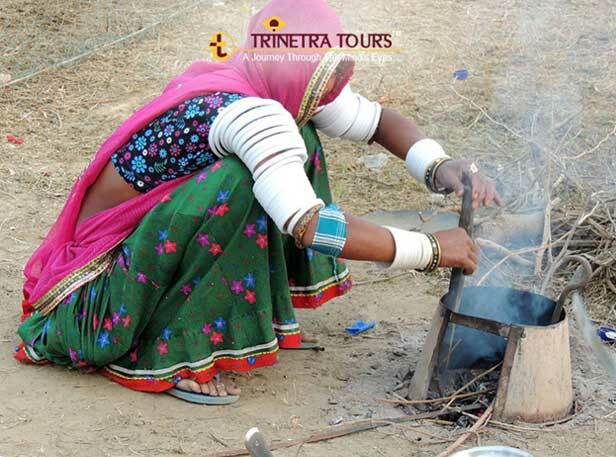 Trinetra Tours are quite simply exceptional. My new “friend” Rahul and I swapped many emails as we organised the trip – the poor man was dealing with a control freak! But all my strange questions were answered quickly and with humour. Information from Trinetra was comprehensive including all we needed to know about the places we were going to visit, and things such as tipping policy and likely weather conditions. And so the itinerary was agreed and flights from London booked with British Airways. Within 30 minutes we had arrived at our hotel for two nights, the Lalit, a central 4/5* hotel close to the CITY centre. Summary: Hotel Lalit - Excellent value for money, stunning breakfast with numerous restaurants and a pleasant pool area. After check in, we headed “round the block” on foot to explore as this was largely a free afternoon. Two cheeky Kingfisher beers 660ml (5.3 Vol) with chicken tikka Delhi style (£6 total) was a pleasant way at “My Bar” to watch the traffic chaos around Connaught Circus (ten minutes walk). And then we walked back to the hotel and I was in heaven. There, behind the hotel in a rundown street were a group of early 20 year olds playing cricket. Milk crates for wickets, a GM Bat that had seen better days and “wooden stick thing” for the non-striker. A tennis ball whistled down from the right arm fast bowler. It was a scene just like the one in Best Exotic Marigold Hotel and I wanted some of it. So I quickly returned to the Lalit, put six new tennis balls into a bag and off I went. This was going to be England v India, the First Test. Just as I turned the corner, it was clear that the group were not happy! One of the batsmen had hit the ball into a private apartment complex and it looked like game over. But who should arrive but a fat 50 year old English man with a bag of balls bought from Sports Direct in Camberley. I was welcomed with open arms, allowed to open the innings and cheered by all when I said good bye. What a start, what great people and proof that sport transcends all race and class barriers. For our first night we went to a restaurant called Veda (discovered via TA) just ten minutes walk from the Lalit and two minutes back by Tuck Tuck (100 Rupees). Veda Restaurant - Gordon Brown, former UK PM allegedly visited with his entourage. Not sure about him or his politics BUT my goodness he knows how to pick a restaurant! Day two and we were picked up by our driver Magvan and Guide Gahendra. Great guys. HUMAYUN’S TOMB – Get there early. Beautiful gardens and iconic Taj Mahal like building. LAZEEZ AFFAIRE (Restaurant) - Quality close to the Embassy well you would expect it with all those ambassadors living nearby. Sadly no Ferero Roche! JAMMA MOSQUE – Largest mosque in India – we both felt a little uneasy. 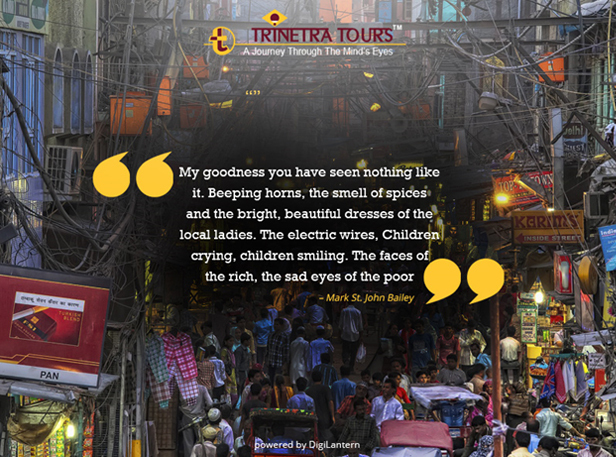 The first was a Rickshaw ride around the streets of Chandi Chowk (Chandni Chowk). Now I moan about the traffic problems in London. But my goodness you have seen nothing like it. 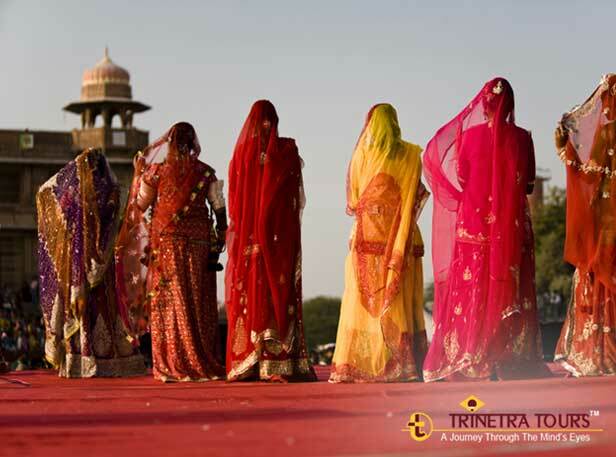 Beeping horns, the smell of spices and the bright, beautiful dresses of the local ladies. The electric wires the likes of which would cause the HSE (The Health and Safety Executive ) to have a heart attack. Children crying, children smiling. The faces of the rich, the sad eyes of the poor. 1 mph if you are lucky. My, what a 30 minute trip that was. And then at night another amazing experience. 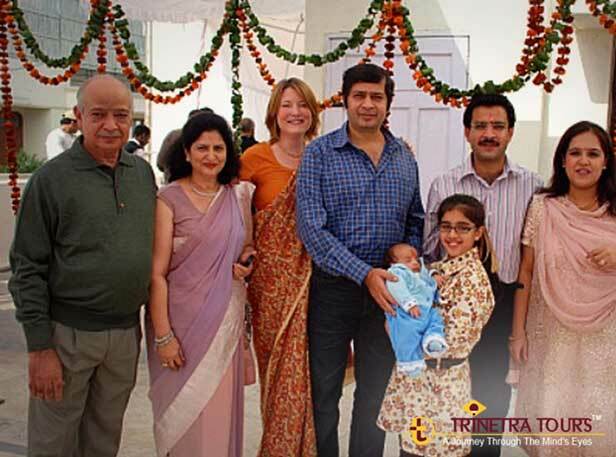 We were guests of Mahendra, his wife and son, who had invited us to dinner thanks to those lovely people at Trinetra Tours. One hour by car and there we were eating and drinking with such lovely Indian people. Cricket, politics, education, the caste system, religion, we covered it all, over a superb meal lovingly prepared. MAHENDRA, you and your family are welcome anytime you’re in London. So on next day by short one hour flight to Udaipur. Romantic city and location for one of my fav’ films the Best Exotic Marigold Hotel, where Dame Judy Dench drinks gin at the funeral. A great two days where we stayed in one of the best hotels I have ever stayed in the Fateh Garh overlooking the Lake. No major report here – so check out the individual TA reports if you want to really find out what to do, see and eat in this magical place. Comment: Hotel Fateh Garh - from here to infinity. One of the best hotels I have ever stayed in, with views to die for. Comment: Dharohar - you would be a Muppet not go to this local Rajasthan Folk Evening. Comment: City Palace of Udaipur - Amazing Palace, beautiful views of the posh hotel. Comment: Ambrai – This may be a tourist restaurant but this is one of the better ones with superb views. Day five and off to Shahpura Bagh, a four hour 230 km drive. I sat in the front of the car with Mr Ram our driver and oh what a journey. Overloaded lorries, camels and coaches. Dead dogs and dodgy drivers. The record for the number of people on one scooter – five. And then the fun really did start. There we were travelling down the dual carriageway/ highay (Highway) at w90kph minding our business when suddenly coming towards us was a lorry ON OUR SIDE of the road. Time up? Well no… we fortunately had God on our side AKA Mr Ram, whose name literally means God. And because of his expert driving skills we averted disaster. Our number was not up this time. We came off the highway into this small chaotic town…. And then the gates swung open into a wonderful oasis. Day, whatever (lost track now) and we had a 190 km drive from Shahpura to Ranthambore. We were off to see some Tigers! Did we see any? Well for that, check out my report, firstly our experiences in the Park itself followed by an update on our hotel, the Del Villas. Comment: Ranthambore National Park Tiger Tiger burning bright, did we see one, did we might (NOT). OK so we saw no Tigers, but I did see a ginger and white cat as we approached the outskirts of Jaipur, some four hours northwest of Ranthambore. We had forgotten about the lack of Tigers and were now fast on the trails of Dame Judy Dench, who, rumour had it was shooting the sequel of the Best Exotic Marigold Hotel!! Could my wife’s heartthrob Richard Gere be there too, or what about Bill Nighy? Well we had two days to track them down in Jaipur, home to the Amber Palace and some 4 million Rajasthani. After checking into our superb hotel…. COMMENT: The Samode Haveli - My bedroom at home should have a minstrel’s gallery and a large plunge bath! We met our Guide Rashid who took us on a most interesting tour of the local markets and into many exciting back streets. This was real India, a bustling, vibrant city and just before their Holi Day so full of people covered in different coloured die. I had to buy some colour to go with my Udaipur outfit – what a picture I looked - NOT! COMMENT: No Elephants for us at the Amber Palace – BOO! Didn’t matter though. COMMENT: Only time will tell if this place is a hit with you. We kept up our search for the cast of the Best Exotic Marigold Hotel, but despite the efforts of our guide, who had met “Q” only a few days before, it transpired they had left for Udaipur. Shame. 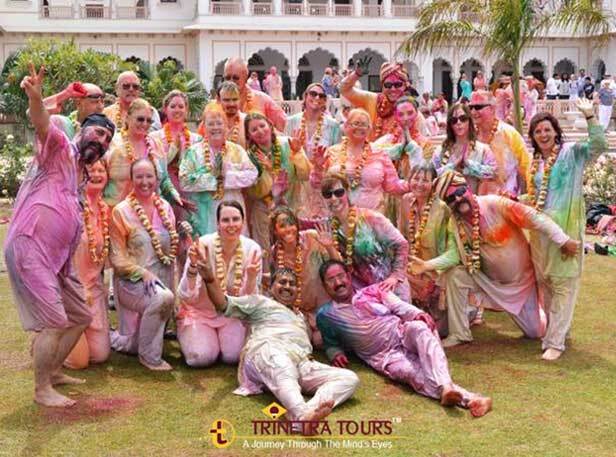 Next day we were fortunate enough to be in India for the “Colour Holi Day”. Basically this is a great excuse to have a day off and run about putting bright powder colours into people’s faces and hair. What a laugh and so I got absolutely covered – a natural target methinks. It summed up India for me – full of life, colour and generally happiness. At 1200 we set of for Agra, en route stopping off at Fatehpur Sikri. Comment: Mahtab Baugh – The Moonlight Garden: Liking the views as the sun went down..
Next day we were up and ready for a big day. COMMENT: The Taj Mahal – Three down, four to go. Petra edging it for me...sorry! COMMENT: Itmad-ud-daulah – Baby Taj – when she grows up will be a stunner! COMMENT: Agra Fort. Bob’s your Uncle! Then it was back to the ITC Mughal for a bit of R and R before dinner and a special meeting with our Guide Annurag’s family. TA COMMENT: ITC Mughal…3.5 out of 5… but credit where credit is due. Next morning it was with sadness that we said goodbye to Mr Ram at Agra’s Railway Station as he dropped us off ready for us to move on by train to Jhansi. Mr Ram had become a true friend over the past week. A fantastic driver, a decent man. Thanks Mr Ram – you lived up to your God like name. Ok, so back with the tour…. Now I like trains, I know that sounds a little weird particularly for anybody reading this who travels on a regular basis with South West Trains. We were in a sanitised environment for our two and a half hour journey to Jhansi some 200km south. Travelling First and with AC a little different from the 3rd and no AC. It was a fascinating experience, right from the “airline style” breakfast – not bad - to the “nasties” deposited on the track. Great views as we travelled along and lots of memories. When we return to India we will use the rail network much more and see even more India if you know what I mean. As the train pulled in to Jhansi, we got ready to jump off and find our Driver for the short trip down to the Orchha. 30 minutes and we were there! COMMENT: Orchha Fort: City and Fort – Frozen in Time and definitely worth a trip. Next a three and a half hour drive to Khajuraho… an interesting drive through lush countryside. Missing Mr Ram, but Bablu our Driver professional and polite. A quick change, a cheeky Happy Hour Gin and Tonic Double at the Radisson and we were ready for the Sound and Light Show…which was fine, but not special, unlike the Temples we saw next day which were simply stunning. COMMENT: Khajuraho Temples – So much more than the Kama Sutra…. But that bit’s really interesting too and has given a new lease of life! COMMENT: Hotel Radisson Khajuraho – If they nail the clippings in the bathroom and improve their general housekeeping in the bedroom this would be a better place to stay.. but corrective action taken and the staff excellent. That afternoon we said goodbye to the big K to go to the Big V… were we saving the best to last? A short 35 minute hop by Spice Jet and we were coming in to land having seen the mighty Ganges from the air. A short transfer from the airport took us the second Radisson Hotel in a row. More about the hotel under the TA Comment section. 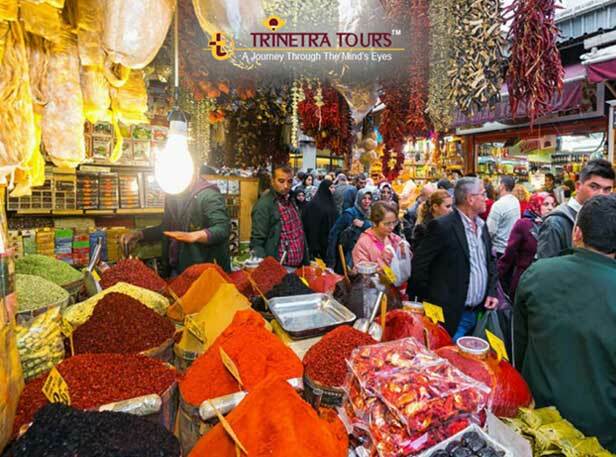 At 5.15pm, we met our Guide Naveen, a most charming family man and again a top selection from those wonderful people at Trinetra Tours…. We walked through the mad streets on our way to the Ghats. 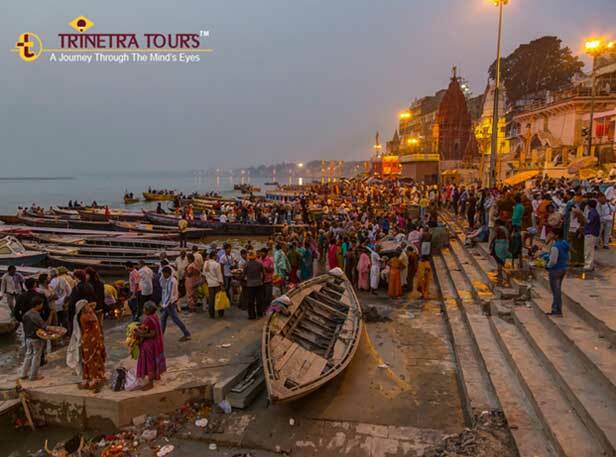 Beggars, dogs, traders, barbers, hawkers, monkeys, bikes, rickshaws, busses, cows, goats, children… you name it and it was walking with us, together with thousands of pilgrims heading to the Holy River Ganges. What we then saw, as the sun went down and the sun came up will stay with me for ever. Comment: The Ganges - This for me was India… The Taj Mahal was special, but for real life head to the Ganges – evening and early morning. COMMENT: Radisson Varanasi – Good hotel, a bit of a bun fight at breakfast! COMMENT: Surya Restaurant – A real find. Great food, great service, great value, great ambience. Simply GREAT! Two days in Varanasi and then we flew back to Delhi and after a night at the Lalit, home to the UK. And so it was with great sadness that we said goodbye to India. As you can see, we had an amazing time and that is down to our friends at Trinetra Tours. And friends they are for life. 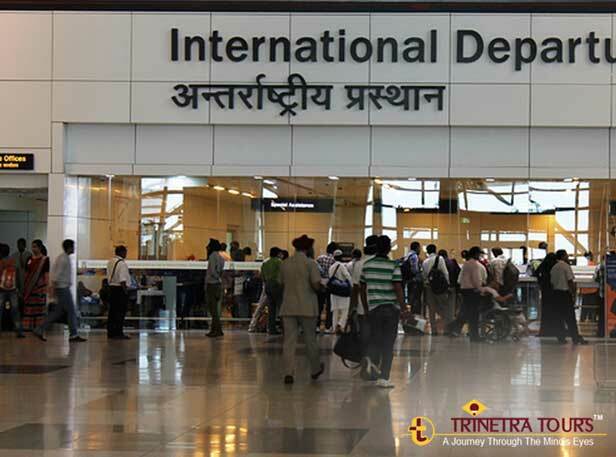 We will return – you should go, but only if you use Trinetra Tours. They are simply the best! Mr. Mark St.John Bailey and Ms. Sarah Bailey, UK.